Here’s a quick checklist when deciding which stain to use. Which stain is best? Is an oil-based stain better than a water-based stain? We’re sure you’ve seen at least five different answers to the same question. That doesn’t clear things up at all. So, let’s first start with a moment of truth: there are more stain types than just water- and oil-based. Each has its advantages. We’ll talk about that in a minute. 1.) Is the stain made for logs? Logs move – a lot – and take a beating from the sun much more than conventional lumber. The budget stains and deck stains you’ll find at the local hardware and paint store are much too rigid and will quickly crack, peel, and fade on logs. Manufacturers who make stain specifically for logs formulate more flexibility into their products to accommodate that movement, which means the stain will last longer. 2.) Are the stain, caulking and chinking compatible with one another? It’s important to keep bugs and weather where they belong – outside. But if your stain, chinking, and caulking aren’t compatible with one another, that bug and weather barrier is compromised. 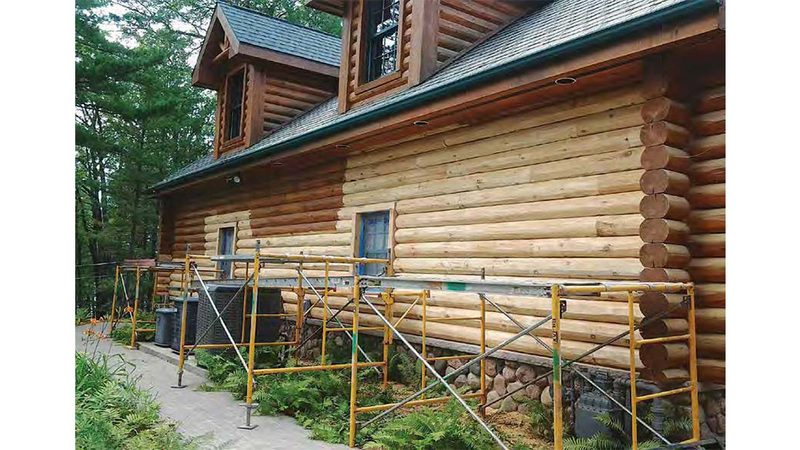 When you consider that an average size log home has over one mile of caulking joints, making sure the stain you use will work with the sealants is critical. It’s easy to find out if they’re compatible: use a system from a manufacturer who specifically formulates their stains and sealants to work together, and if it’s not a system from the same manufacturer, be sure to contact both the maker of the stain and the maker of the sealants. Chances are, they’ve tested their product with others and know the answer to that question. 3.) What look do I want? That picture in your minds’ eye is probably pretty developed. So, go get it! Answer these questions before you choose a stain type and it’ll help you narrow down the type you choose. What sheen do I want? Flat? Glossy? Somewhere in between? Am I going to do maintenance, or am I going to hire someone? 4. What stain type should I choose? Not all stains are created equal, and how deep a stain penetrates doesn’t necessarily equate into better performance. See the charts below for the advantages of different stain types. Keep in mind: no matter what stain you choose, proper wood preparation is the most critical factor when it comes to longevity. So, don’t just consider the product, but also consider what kind of prep is necessary before you stain. That said, on exposed logs and wood, it’s best to stick with either a surface stain or a shallow penetrating stain. Both will result in the best long-term durability and beauty you desire. 5. How do I pick a color? Color is a sensitive issue! Best way to get the color you want is to request samples and test several different stains. That said, stay away from clear stains. Why? A clear stain has very little UV protection in it. It’s like using an SPF 8 with no other sun protection. Your logs will get sunburned and discolored in very little time. Stick with high quality, UV absorbing stains loaded with pigments – which is where you get the majority of your UV protection – and follow these stain sampling procedures to make sure you get it right before you start. Like what your read? Need more information? We've asked industry experts, Sashco Sealants to help us answer your questions on all thing maintenance. Click here to see more.